Having a cold salad or dessert is necessary on our lunch table. This pina colada salad is one of the most delicious salads I’ve ever had. Check it out. 1 (20 ounce) can of crushed pineapple with juice. 1 (3 ounce) package of instant coconut cream pudding mix. ½ cup of flaked coconut. 1 (8 ounce) container of cool whip. 3 ounces of cream cheese. ⅓ cup of white sugar. 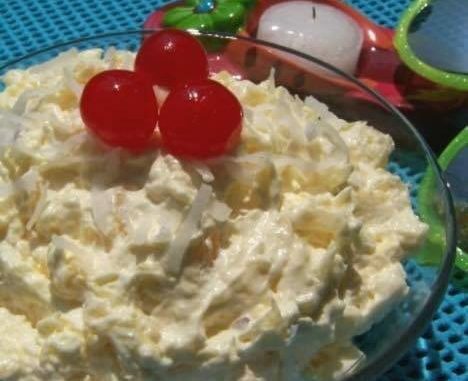 In a large bowl, mix together the crushed pineapple, the instant pudding and coconut. Stir in the cool whip and mix until well combined. In a second bowl, mix together the cream cheese and sugar until creamy then pour the cream into the pineapple mixture. Stir to combine and chill before serving. Easy, peasy and creamy! Rather as a salad or a dessert this pina colada is just perfect. You can top it with red fruit if you want. Give it a shot, you will love it!